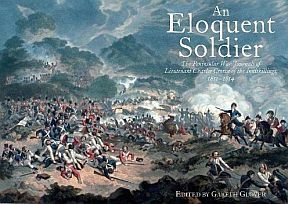 The story of a junior officer in the Peninsular War, as told through the journals of Lieutenant Charles Crowe of the 48th (Northamptonshire) Regiment of Foot and later of the 27th (Inniskilling) Fusiliers, is a fascinating and absorbing tale. It therefore may appear very surprising, that these journals have never been previously published in full; but indeed without the diligence and sheer tenacity of Crowe’s very distant descendant, JJ Heath-Caldwell, affectionately known as JJ, it is more than likely that they never would have been brought to print. JJ Heath-Caldwell was born and raised in New Zealand and had no contact with his father’s British relatives until in 1980 as a young man he chose to visit Britain for a one year working holiday. His grandfather, Captain Cuthbert Heath-Caldwell DSC Royal Navy, had died the previous year; however JJs maiden aunt continued to live at the family home in Dorset. The family had sold their estate of Linley Wood in Staffordshire in 1949 and moved to a thatched cottage in Dorset; and all the relics of the family had been hung on every available wall; filled every cupboard and shelf and numerous locked chests stacked high. Centuries of family history just lay there gathering a thick layer of dust as it all sat in a time capsule, just waiting for someone to show an interest. That person was JJ, who decided to remain and establish his career in Britain and over the intervening years has been working diligently to sort through this treasure trove as time and career have allowed. One book that particularly fascinated him was an old leather bound diary with the title emblazoned in gilt lettering on the spine Peninsular Campaign Volume 1. Finding the extraordinary story of this young man who went to fight against Napoleon’s army in Spain a riveting read; he was cut short as the volume ended in mid campaign. There was clearly a second volume; his aunt could remember its existence; but where was it now? A thorough search of the house revealed nothing; it would appear to have been lost forever. However JJs dogged spirit led to appeals being launched throughout the family and on the internet in what seemed a hopeless search for the missing journal. When all hope seemed to be at an end; an e-mail from Australia announced that the second volume did exist and had just been quoted by Martin Cassidy in his bookMarching with Wellington; with the Inniskillings in the Napoleonic Wars published in 2003. It would seem that Volume Two was held by the Inniskilling Fusiliers Regimental Museum at EnniskillenCastle , who presumably had been lent it many years before. All sides felt that the journals should be re-united and after some negotiations, the museum handed their volume to JJ who is determined to ensure they never get parted again. Volume Two formed the centre piece of Martin Cassidy’s work; however owing to size constraints, a great deal of the journal was omitted entirely or passages cropped; and unfortunately this has in my view damaged the integrity of the whole. This, now combined with the contents of Volume One, means that two-thirds of the present production has never previously been published. The reader may wonder that with the profusion of military memoirs of this period which have already been brought to print; hasn’t everything already been said? Is there any point? The answer on so many levels is an emphatic Yes there is! The Inniskillings are a very famous regiment who fought with courage throughout the Peninsular War; indeed it was the only regiment in the British Army with three battalions that were all serving on foreign service in various parts of Spain . But despite this; the only known memoirs from persons serving in this regiment are that of Francis Simcoe, who died at the siege of Badajoz in April 1812; and that of Private Emerson who again describes the scene at Badajoz and the carnage of Albuera, which he observed shortly after the battle. But that is the sum total of their expanse; there is no witness to their exploits at Salamanca, Vitoria, the Pyrenees, San Sebastian, the Nivelle, the Nive, Orthes and Toulouse; Charles Crowe fills that void almost completely. At the same time; there are actually no memoirs at all relating to the 48th (Northamptonshire) Regiment beyond the short journal for 1811 of Major William Brooke; therefore the eighteen months that Charles Crowe served with them are invaluable. But there are more to the journals of Charles Crowe than this; for although the journals, as they survive, with their clean, tidy script, show that they were written in older age, when memories have faded and blurred with time; it is however clear that they are actually fine copies taken from original journals written literally as events occurred whilst on campaign, and interspersed with copies of the few letters he seems to have sent home to his parents. Their veracity is shown clearly, by the fact that I have found very few instances where the official documents differ from Charles’ version of events, and on most of those occasions I have been able to prove pretty conclusively that Charles’ version of events seems the most likely. Certainly his version in total has the feel of authenticity and I have found no reason to doubt him. Charles Crowe wrote his journals purely for the fascination of his family and paints fine pen portraits of his fellow officers, of all ranks, with candid honesty. He clearly disliked many of his colleagues and is not afraid to voice his views on each; from bullying superiors to insupportable prigs; from duel-happy ensigns to abject cowards; from gamblers and sots to rapists; Charles pulls no punches. He describes battle in a matter of fact, but feeling way; the death of a soldier is described in lurid detail but not without honouring their memory and evident feeling for their loss. His portraits of incidents are also enhanced by dialogue, the gist of which was presumably recorded, at the time, and padded out later. Indeed at times his journals can read like a novel; although clearly based on verifiable fact; is it going too far to describe him as the Dickens of the Army? From his evidence, it becomes clear that the rigid class difference between soldier and officer, so evident within barrack life where their paths rarely crossed; crumbled into a close familiarity on campaign that would not be unrecognised by soldiers today; the earthy banter between general and private, was given and received, without a thought to the blind adherence to subordination we can now erroneously attach to this era. When you face death daily together, rigid convention is discarded as chaff to the wind. The journals of Charles Crowe will destroy at a stroke many of the rigid preconceptions made by historians of this era of warfare. Many of the memoirs by officers that survive are from very senior officers or those on their Staff; where they were inevitably distanced from the ordinary soldier and the every day life of petty warfare; or from those of Guards officers, whose wealth and connections ensured a very comfortable lifestyle even when on campaign. These can therefore give a rose-tinted version of life for an officer at this time; a life that was completely alien and unrecognisable to junior regimental officers in the average ‘line’ regiment such as Charles. This could be why on the few occasions Charles has cause to refer to Guards officers he does so with indignant disparagement. Few journals have got so near to the honest nitty-gritty of everyday soldiering of this period; clearly showing the harsh life; the abject misery of long wet and cold marches; the flea bitten hovels that served as billets; the inconsistent supply of food and the scarcity of ready money to make good their rations; the constant problems of purchasing, maintaining and securing from theft their horses and mules; the sudden horrors of war and agonising deaths or mutilations; constant illness and extreme fatigue; long hours on picket duty and little sleep, oh for a soldiers life!! Charles Crowe is not always loveable; he rails against the world and occasionally over indulges in religious ideals and morals, he can also whinge; but over all we get the picture of an honest, everyday man, trying to succeed against adversity and we can admire him for triumphing over it all. Having studied this period in history for some thirty years; Charles Crowe has still managed to educate me on many aspects of their lives and taught me much I did not know; he challenges many preconceived ideas and in my view is a MUST for anyone who really wants to understand what it was like to fight with Wellington’s Army in Spain.